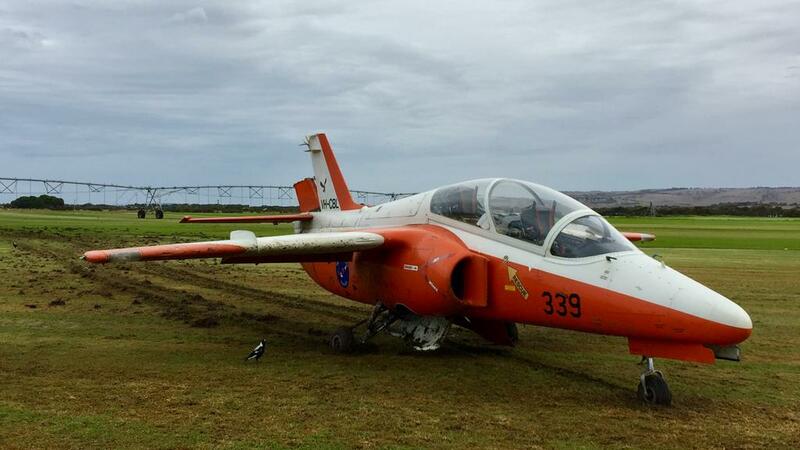 The SIAI-Marchetti S.211 jet trainer aircraft force landed in a paddock after a loss of engine power. During rollout, the tail of the aircraft hit irrigation pipes causing partial separation of the rudder. The pair was making their final approach into Goolwa Airport after aerobatics training when the Aermacchi S-211 turbo-fan powered military trainer suddenly lost power just after midday. Pilot Jim Whalley said he started looking for a paddock when the throttle stopped responding. “It was like: ‘We’re not going to make it back to the airfield’, so start looking out for a paddock to land,” he told the Sunday Mail. 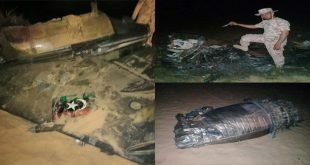 With 28 years’ experience in the Royal Australian Air Force, Mr. Whalley said there was no time for panic when the engine cut out. “I think the heart palpitations will probably come over a glass of scotch tonight,” he said. Although safely on the ground, Mr Whalley still had to steer the aircraft underneath a low-hanging sprinkler system. “As I’m ploughing through the paddock it was like go in between the pipes, which we managed to do,” he said. Mr Whalley is South Australia’s chief entrepreneur and the co-founder of defence industry company Nova Systems.